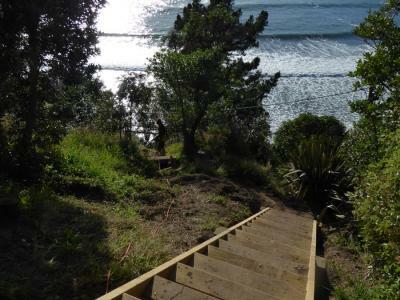 On this steep Taylors Mistake hillside property we are constructing a series of timber steps down to the public access walkway that leads to the beach. The design brief from this family of keen surfers was for functional, robust steps in keeping with the low key style of their bach. Linking the sets of steps we’ll build short pathways and pads, surfaced with compacted gravel. The longer sets of steps will have a galvanised steel pipe handrail for safety, and to help the clients haul themselves back up the hill after surfing. This new seaside Redcliffs home has fantastic views over the water to the end of Brighton Spit and out to the mouth of the estuary. The brief for this property was to deliver a low maintenance garden in which the clients could sit back, relax, and enjoy the ever changing views. On this compact site we have built narrow raised Corten planters on three sides of the property. Gravel pathways, honed bluestone pavers, Otago schist stone mulch and large volcanic boulders complete the look. For this landscape project in Lyttelton, the client wanted an oudoor living area where they could enjoy the views out over the harbour, yet be protected from the easterly wind, the bane of many Christchurch properties! They also wanted to bring some colour into their garden. The existing concrete retaining wall behind the house is well built and had sustained no earthquake damage but was looking rather rough. The wall was plastered, taking out the undulations and creating a uniform look, and painted a warm, vibrant orange. On a steep Canterbury hillside property in Mt Pleasant, we have been building a series of steps, pads and raised planters coming down from the outdoor living area adjacent to the kitchen. On to the final touches now - planting out and mulching. A new landscape design and build project that we have underway is overlooking Corsair Bay, in Lyttelton Harbour. Here we have built a retaining wall across a part of the property to create a larger flat area than was there before. On a steep section like this, usable flat land is precious! Part of this newly formed area will be lawn and part will be paved. The paved area will provide a low maintenance outdoor living area where furniture can remain in place all year round, without having to worry about damage to the lawn. 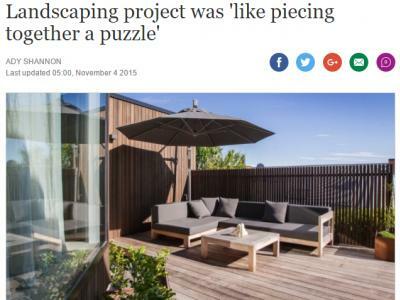 Journalist Ady Shannon wrote an article on one of our recent native themed projects that was published in The Press and on www.stuff.co.nz, titled "Landscaping project was 'like piecing together a puzzle". The property is on St Andrews Hill in Christchurch, and the owners both work for Clive Barrington Construction. They wanted an easy-care, easy-living landscape design that looked mature despite being a new, post-quake rebuild. Our current project is on a large section near the head of Lyttelton Harbour that has fantastic views of the surrounding hills. The client’s brief is to design and build a potager garden, a French term for a kitchen garden. This garden will provide a formal element on this otherwise semi-rural property. The previous house on this Mt Pleasant property was demolished because of earthquake damage. The clients were left with an almost blank site to build their new house and create a new garden. Only a few established trees on the perimeter of the property were left. After a muddy start to this project we are now well under way. The warm, dry spring weather has certainly made the job easier! Hillside garden design comes to completion! This week we are putting the finishing touches to the hillside garden design we started at the end of last year. The brisk weather experienced over the last week is certainly a contrast to the hot days we spent here over summer! The slats have been installed, the garden has been mulched and the final plant out is almost done now. It is pleasing to see all of the elements of the garden come together in a unified design. Read more about Hillside garden design comes to completion!